Pegboard and Slatwall Sign Holder Faceout. This pegboard sign holder faceout and slatwall sign holder faceout offers a convenient way to put signage on your perimeter or floor fixtures. Display two ways: Forward facing for a straight-on sign, or aisle facing to call attention to your merchandise from the side. The sign holder bracket features a 3/8" thread to accept your existing 3/8" threaded Palay Display sign holders or purchase complete with a sign holder. Offset mitered corner or plexi with metal channel sign holders on slatwall or pegboard, or add sign holders to pegboard and slatwall floor displays. This pegboard sign holder faceout and slatwall sign holder faceout is 12" long with a 1" upturned end. 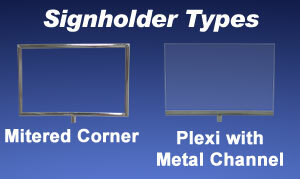 Images shows sign holder faceout with #2227 11"W x 8 1/2"H sign holder.